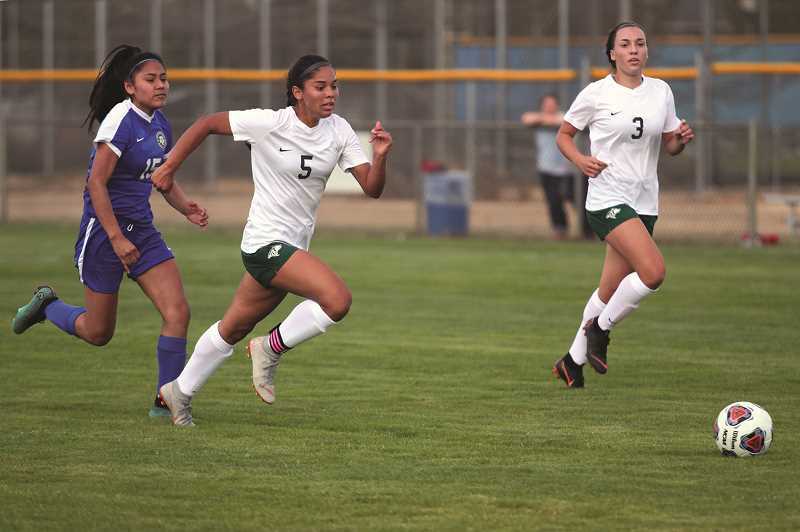 The North Marion girls soccer team earned a resounding victory in its season-opening game at Woodburn High School on Thursday, defeating the Bulldogs 8-1. Led by senior Mar Verastegui's four goals, the Huskies scored early and often. Freshman Dominique Huapeo was the first to get on the board with a goal in the opening minutes assisted by sophomore Hailey Welch. Verastegui added back-to-back goals, assisted by Welch and Huapeo before Woodburn got on the board on a penalty kick converted by freshman Myranda Marquez. Sophomore Danielle Christenson made it 4-1 late in the first half on a point-blank shot assisted by freshman Teagen Welch, and sophomore Mya Hammack added one more before the end of the half on a pass from Huapeo. In the second half, Verastegui added two more goals on assists from Huapeo and Hammack before Hammack finished off the offensive barrage with an unassisted goal in the 70th minute. North Marion (1-0) was scheduled to host Junction City (0-0-1) on Tuesday before traveling to Valley Catholic (0-0-1) on Thursday. Woodburn (0-1) was scheduled to host Sweet Home (0-1) on Tuesday, and travels to Hillsboro (0-1) on Thursday to finish the week.